I was in the mood for something bright and bold, so this week I have got a bit of a punk manicure to show you. 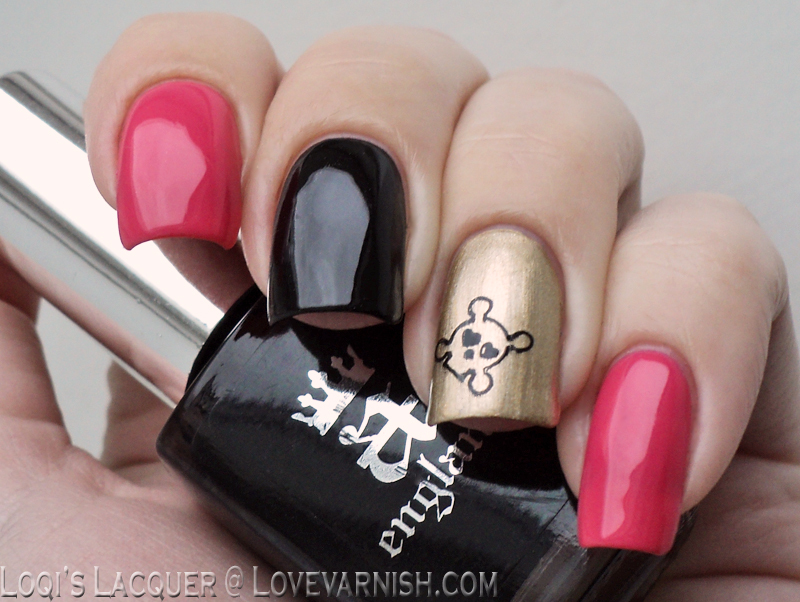 It's really quite a simple manicure, just solid pink, black and gold, but I love how it looks! The pink polish (I love this one, I need backups!) is Kiko 282 Coral pink, the black is A-England Camelot and the gold is China Glaze Passion. The little skull is from an Essence plate, so cute! So simple and it looks awesome! So, what color did you paint your thumbnail? That's really cute! I wouldn't be able to resist adding studs, after seeing the skull, lol. It looks great! Love it, really nice colours combo and the skull is a great little detail! It does! I was really surprised how much I liked this :). I'm a sucker for textured polish- this is stunning!